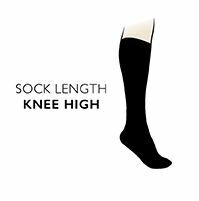 Designed to give precise, targeted protection and comfort for lovers of all winter sports, Bridgedale Vertige Midweight Over the Calf Merinofusion Ski Socks incorporate a Precision Fit System with Lycra® throughout for a supportive, wrinkle free fit. The socks enhance technical fibres such as Endurofil with natural merino wool for improved softness, warmth and wicking abilities, keeping you dry and comfortable. With hand linked toes for smooth seams to reduce potential for abrasion and a left/right specific fit, protective cushioning is placed where it is most needed. Terry knit shin pads, along with full foot and toe padding, leaves the non-cushioned zones thinner to maximise your range of motion for improved control, feel and performance.